What could be easier or more fun than coaching youth sports? How complicated could it be—it’s all fun and games, right? Unfortunately, coaching kids isn’t that simple. If you’ve ever watched a youth league game, you know that all sorts of pressures, worries, concerns, and emotions come into play when your kid is out on the field. In fact, it’s not unusual to witness at least one ugly incident at a game where a coach or parent has gotten out of control. The good news is, as a coach, you can guarantee that kids have fun, get the physical and psychological boost they need, and want to play on your team next year. And now this book shows you how. 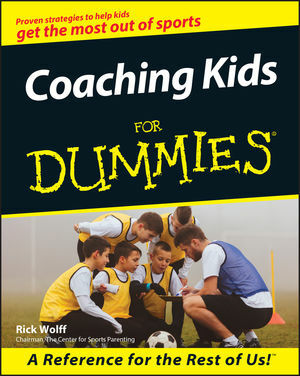 Loaded with tested-in-the-trenches strategies for helping kids get the most out of sports, Coaching Kids For Dummies is every youth league coach’s survival guide. Rick Wolff, a nationally recognized sports-parenting expert, coach, and author, who is also a former professional baseball player, currently hosts a popular sports-parenting program on WFAN radio. PART I: A Parent's Primer. Chapter 1: An Introduction to Sports Parenting. Chapter 2: Determining the Right Age to Begin Sports. Chapter 3: Dealing with Your Child's (And Your Own) Disappointments. Chapter 4: Evaluating the Pros and Cons of Travel Teams. Chapter 5: Understanding the Differences between Individual and Team Sports. Chapter 6: Outlining Your Responsibilities As a Youth Coach. Chapter 7: Setting Up for the Season. Chapter 8: Preparing and Conducting Practices. Chapter 9: Coaching during a Game or Meet. PART III: Motivation and the Mental Game. Chapter 10: Motivating Today's Young Athletes. Chapter 11: Teaching the Basics of Good Sportsmanship. Chapter 12: Handling Tough Situations with Your Team. Chapter 13: Coping with Kids' Sports Injuries. Chapter 14: Coaching Your Own Child. Chapter 15: Dealing with the Stresses of the Job. Chapter 16: Ten Things Every Parent Should Know. Chapter 17: Ten Great Coaching Tips. Chapter 18: Ten (Actually, 20) Brief Tips for Becoming a Great Coach. Appendix A: Youth Sports Organizations. Appendix B: The Coach's Resource Kit.